Investment apps have exploded in popularity in recent years, with both existing brokerages and new companies offering mobile apps to help you invest. 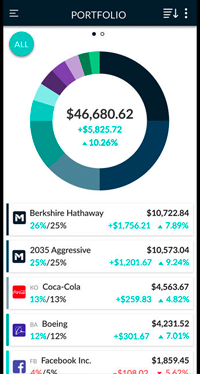 There are apps for all kinds of investors, from the beginner just looking to dip a toe in the water to the old hand who wants to analyze individual stocks on the go. The features that are most important to you will vary depending on your investing goals and the budget you’re working with. We’ve rounded up a collection of apps for every kind of investor out there, whether you’re making your first trade or have been doing it for decades. For each app on this list, we’ve provided user ratings on both the iTunes store (for iPhone/iPad apps) and Google Play store (for Android apps); they are current as of this article’s publication. Robinhood, founded in 2014 by former Stanford roommates Vlad Tenev and Baiju Bhatt, prides itself on being a commission-free way for anybody to buy and sell stocks, options, cryptocurrencies and exchange-traded funds (ETFs). In lieu of commissions, Robinhood makes money through its premium Robinhood Gold service, which is aimed at advanced investors and charges $10 a month. The mobile app is intuitively designed for a seamless experience. In fact, Apple presented Robinhood with its Design Award in 2015, a feat no other investor app had achieved at the time. Robinhood is best for investors who already have some idea of what they’re looking to invest in. Since the app doesn’t have much in the way of educational resources or research, you’ll need to know what you’re doing if you want to hit the ground running. 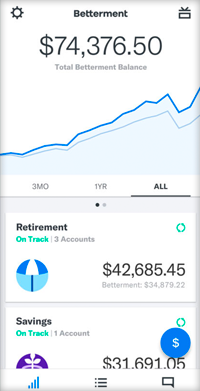 If you want to start investing but aren’t diligent about saving money, Acorns may be the app for you. Acorns is a robo-advisor that saves your spare change for you. In addition to the spare change method, you can also set up one-time or recurring deposits in your investment account if you like. You can open a standard investment account — called Acorns Core — or an individual retirement account (IRA), Acorns Later. While you can choose from a range of portfolios from conservative to aggressive, that’s the only customization available to you. The app charges $1 a month for Acorns Core and $2 for Acorns Later. College students with a .edu email address can access Acorns Core for four years, free of charge. TD Ameritrade is one of the most well-known brokerage firms in the country, and its mobile app is well suited for the investor that wants as much information as possible. 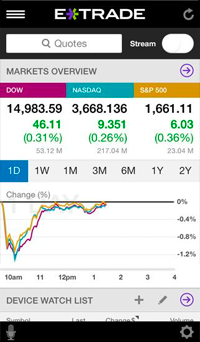 The app is chock full of research and data on stocks, companies and markets, and there’s also a series of educational videos designed to teach you about different investing strategies. Additionally, you can check up on your investments, view a breakdown of your portfolio and make trades, all within the app. Finally, you can set up alerts so that you’re notified of breaking news or when a stock hits a certain price. 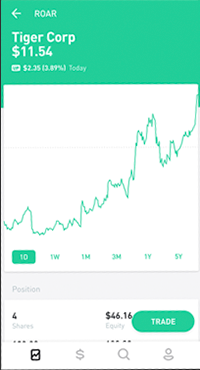 In addition to the standard TD Ameritrade mobile app, the brokerage firm also has a standalone TD Ameritrade Trading app, which mobilizes its thinkorswim trading platform. This is meant for confident investors who want more customization. Most trades will come with a $6.95 fee. Stash is designed to help beginners make their first foray into investing. It caters to these beginners with its ample educational content and its Stash Coach feature. Stash Coach is part game, part educational tool, and it’s designed to help you better understand investing. You can participate in customized challenges and track your progress as you amass more investing knowledge. When you first download the app, you’ll answer a few questions to establish how risk-averse you’d like to be and what your goals are. 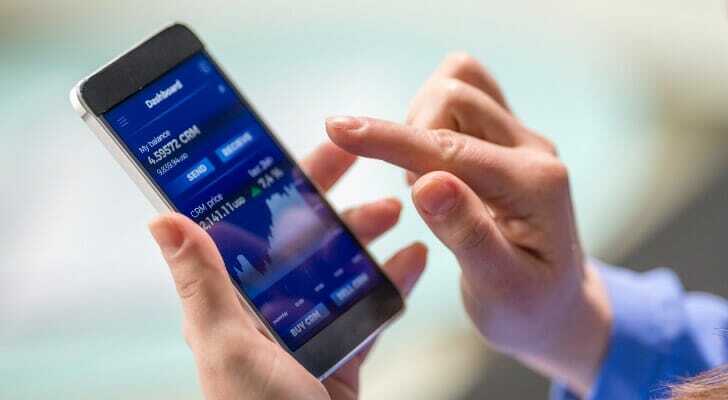 Then, the app will suggest a collection of ETFs and individual stocks for you and populate the education tab with content tailored to your situation. The actual act of building your portfolio will be up to you, as Stash only provides suggestions. However, the app may nudge you in a different direction if your portfolio isn’t diversified. You’ll need only $5 to start investing with Stash, thanks to the ability to purchase fractional shares of the 110 individual stocks available within the app. You can open traditional brokerage accounts as well as traditional and Roth IRAs with Stash for $1 or $2 per month, respectively. For customers under the age of 25, retirement accounts are available free of charge. M1 Finance is an app for long-term investors who want the choice between hand-picking stocks or letting the app invest for them. With M1, investors can choose a model portfolio powered by a robo-advisor; manually select a portfolio of stocks and ETFs; or choose a mix of both strategies. The hybrid setup makes the app a great fit for investors who want some flexibility. M1 offers a taxable account and an IRA account. Both are fee-free provided you invest at least $100 or $500, respectively. Investors looking for minute-to-minute trading functionality won’t find it with M1, and the app doesn’t have much in the way of research materials. If you’re looking to read up on potential stocks or ETFs, you’ll need to do it outside the app. Wealthfront, founded in 2008, is a robo-advisor that invests your money in a portfolio of ETFs and (in some cases) individual stocks. Portfolios typically contain six to eight ETFs from a larger catalog spanning 11 different asset classes. Once you’ve opened an account and answered a few questions about your goals and risk tolerance, Wealthfront will take it from there. Proprietary software will automatically rebalance your portfolio as needed, allowing you to focus on other things. In terms of fees, you’ll face a 0.25% account management fee. However, if you refer a friend who then funds an account, both of you will have the fee waived for the first $5,000. You’ll need at least $500 to open a brokerage account with Wealthfront. That’s high relative to other investing apps on this list, but it’s still a relatively low figure when it comes to investing. Also keep in mind that, since Wealthfront is a robo-advisors, you won’t be able to have a hand in fund selection or make trades. Betterment, founded in 2008, has the distinction of being the first publicly available robo-advisor. Betterment’s software creates custom portfolios for each user based on an initial survey. 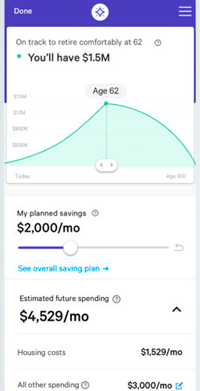 Like Wealthfront, its most direct competitor, Betterment charges a 0.25% account management fee. However, Betterment has no account minimum, so you can start with as small an investment as you like. Investors can choose between a digital portfolio or a premium portfolio. With a premium portfolio, you can receive guidance on outside investment accounts and speak to certified financial planners (CFPs) over the phone 24/7. The premium portfolio comes with an account minimum of $100,000 and a higher, 0.40% account management fee. The E-Trade mobile app is the app for the trader who likes having a lot of investment options. You’ll have access to thousands of stocks, options, futures, ETFs, mutual funds, bonds and more. Many of the ETFs and mutual funds are commission-free. Trading fees for other investment products range from $0.75 to $6.95, with discounts for investors who make more than 30 trades each quarter. 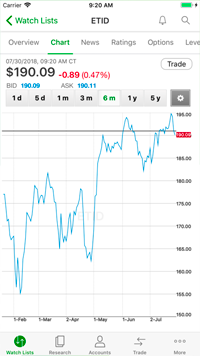 In addition to trading capabilities, the app has news and market analysis from CNBC, MarketWatch and Morningstar. You can also set up personalized stock alerts and compile watchlists of investments to more easily keep tabs. If you’d rather not do all the work yourself, you can choose E-Trade Core Portfolio, E-Trade’s robo-advisor offering. You’ll need a minimum balance of $5,000, and you’ll pay a 0.30% fee. Formulating an appropriate asset allocation is a crucial part of planning your investment portfolio. It’s smart to split up your assets across different asset classes and economic sectors. That way, the success of your portfolio isn’t overly attached to one area of the market. If you have a complex financial situation or just want to ask someone questions face-to-face, you may be interested in working with a traditional financial advisor. SmartAsset’s free advisor matching tool can help. Just answer some questions about your financial situation and goals, and you’ll be matched with up to three local advisors who meet your needs. Hunter Kuffel, CEPF® Hunter Kuffel is a personal finance writer with expertise in savings, retirement and investing. Hunter is a Certified Educator in Personal Finance® (CEPF®) and a member of the Society for Advancing Business Editing and Writing. He graduated from the University of Notre Dame and currently lives in New York City.